While as Ulta last night I saw the new OPI Pure Lacquer Nail Apps. 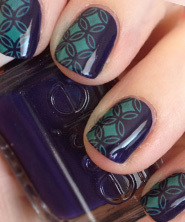 They are OPI’s version of all the real nail polish nail stickers we’re seeing everywhere (like from Sally Hansen, etc). There were a lot of fun designs, so I picked up a couple to try out. 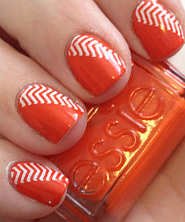 The main attraction of these nail apps is the fact that once applied they last a long time. I’ve heard that if you put a top coat on as well, they last even longer. Kind of nice! That would be a major draw for me except that I love to change my nail polish so often. Since I’ve only had these on overnight, I can’t attest to the longevity of these nail strips, but going off of what numerous bloggers are saying, I would assume they are long wearing. 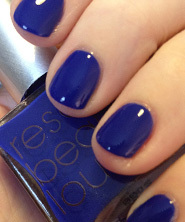 When it comes to the price, I think you’re definitely paying for the brand name with the OPI Pure Lacquer Nail Apps. The high price point of $11.95 at Ulta seems steep for something I’m only going to wear for a couple days. For the average consumer, though, I think it would be a great alternative to going to the salon for a professional manicure. You can get the Sally Hansen Nail Effects strips for a few dollars cheaper and they seem to be the exact same thing. And the Sally Hansen ones come with a nail buffer and orange stick. Seems like a better deal all around. You can find the OPI strips cheaper online if you shop around. Here the exact ones I tried but for half the price that I paid at Ulta. The application was fairly easy, but they only give you 8 sizes (2 of each). The two largest were WAY too big (maybe for toenails? ), and the smallest was way too small. I was left with the few in the middle and I had to trim the sides on those to get them to fit right. Even then, I couldn’t get the shape of the strips to look as nice on my nails as I could have with a traditional nail polish manicure. I’m a perfectionist and it really bothers me. You can see in the photo at the top of the post that the strip on my pinky finger wasn’t the correct size. Just a small thing that bugged me. That being said, I think I’ll hold on to these for the next time I go on a trip. They would be great for travel since all you would need is a nail file to finish off the application. (BTW, I’ll do a “Traveling with Nail Polish” video soon. I have a trip coming up so I’ll film how I pack my nail polish). 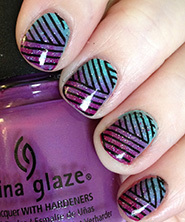 To see an example of how these nail polish apps work, view this video from Kandee. She shows the Sally Hansen version, but the application is the same. Hm…Wouldn’t it be better if they sell these polish in sheets and sell punches (like our paper punch) with different sizes for optimum fits? People can buy a set of 5 punches that fit the widths of their nails and keep buying sheets of these polish apps. Hm Wouldn’t it be better if they sell these psiolh in sheets and sell punches (like our paper punch) with different sizes for optimum fits? People can buy a set of 5 punches that fit the widths of their nails and keep buying sheets of these psiolh apps. I tried the Jamberry nail shields recently and the fit really bugged me as well. Maybe not great for we artsy perfectionist types? Also I think that you lose a lot of the “polish” when you’re using a plastic shield as opposed to a nail polish.